1 to 5 people from an institution $715 ea. $735 ea. $785 ea. 6 to 15 people from an institution $695 ea. $715 ea. $785 ea. Payment in full for the National Conference must be received by check, cash, credit card, or purchase order before attending this event. Name substitutions may be made at any time. Full refunds will be given for cancellations received by June 28, 2019. Registrants who cancel between June 29 and July 12, 2019 will be charged a $150 cancellation fee. Registrants who do not attend or who cancel after July 12, 2019 are liable for the entire registration fee, including cancellations for medical, business, or family reasons. Please note: Non-payment does not constitute cancellation. 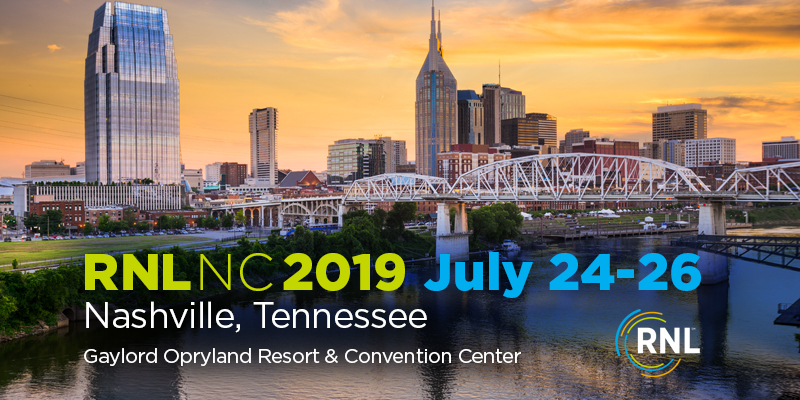 If you're ready to learn, innovate, and remain competitive in a shifting landscape, the 2019 RNL National Conference is the place to be.